The body’s own fat and stem cells contained therein form the basis of several procedures for natural augmentation and shaping of the breast. The breast augmentation can be done either with autologous fat (lipofilling) or stem cells (cell-assisted lipotransfer, CAL). Both procedures are carried out in gentle local anesthesia, the gained breast volume consists entirely of the body’s own tissue. Many women regard their breasts as the characterizing feature of their femininity. This may be the reason why the shape and size of the breasts is often important to many of them, regardless of the woman’s age. Almost all our patients want to have natural looking breasts in the right proportions to the rest of their body. For the most part, our patients consider their breasts to be too small and suffer a great deal as a result. Frequently, the cause of this suffering is due to differences in size or unwanted changes in shape and loss of volume, especially after breastfeeding. If the breast had to be removed, e.g., after suffering from cancer, many women want to get rid of the external traces to the most possible extent. 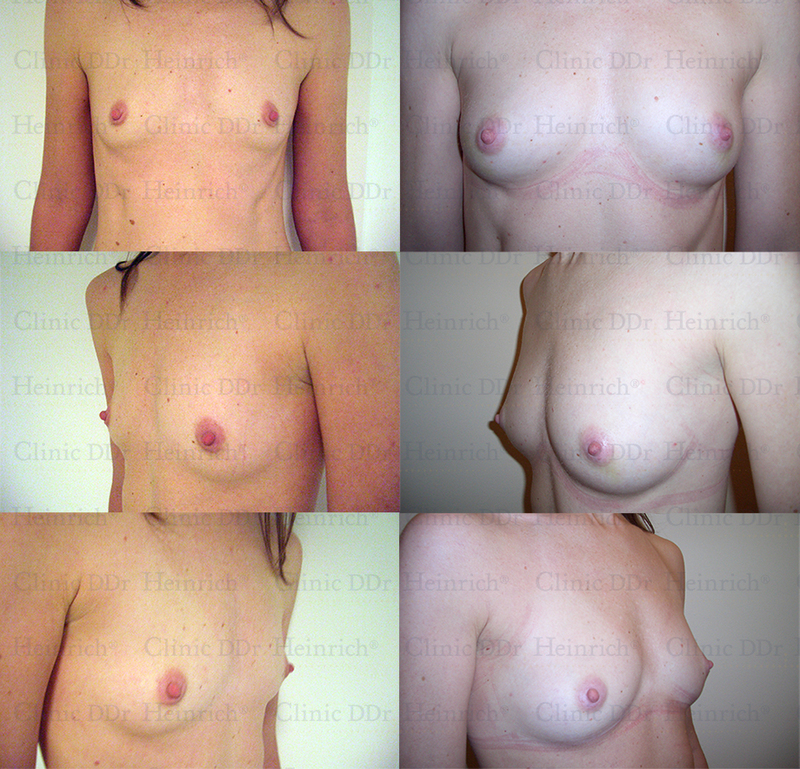 Essentially, the appearance of the breasts is determined by genetic and hormonal factors. Therefore, changes are not brought about by lifestyle habits, sport, nutrition etc., or only to a very limited extent. We offer different breast augmentation procedures which all have one thing in common: Your autologous fat is used as a basis. We do not use any artificial filler such as silicone or Macrolane. In our opinion, the patient’ own fat has the following advantage: Almost everyone has enough of it and most people would be glad to have a little less. As only your autologous fat is used for breast augmentation, the new, additional breast volume consists of your autologous tissue. Autologous fat is eminently suitable as filler, because it looks “real” in any position (regardless of whether you are moving, standing or lying down) and feels natural to the touch. The natural breast function (e.g., breastfeeding) is retained after surgery with autologous fat. In the initial phase, the required amount of autologous fat is gently extracted by hand. We use conventional regular cannulas for liposuction or the thinner microcannulas according to your wishes. In our clinic, liposuction is carried out without using scalpels or general anesthesia. If the healing process is normal, practically no scars remain. We work exclusively using local anesthesia so that you are mobile after surgery and can be discharged to go home. Normally, the breasts can be augmented by a half up to a maximum of two cup sizes. Results may vary from patient to patient. Please note that in medicine generally no guarantee for a certain treatment result can be given. All after photos show the results actually achieved by the treatment. To protect the anonymity of the depicted persons individual physical characteristics (e.g., moles, tattoos) might have been removed. Results may vary from patient to patient. Please note that in medicine generally no guarantee for a certain treatment result can be given. The process begins with a detailed medical consultation. All arguments for and against breast augmentation will be explained to you and we will inform you about which preliminary examinations are necessary, should you decide on having breast augmentation performed. After you have gathered all medical findings, you should have one or several further medical consultations and then schedule an appointment with us. On the day that surgery is carried out, another consultation takes place with the physician before surgery. When all formalities have been settled, photographic documentation is prepared. We require your autologous fat for the actual breast augmentation, which is obtained using liposuction from the areas you want it taken from. First of all, the areas to be liposucted are marked on your body. After your body has been disinfected, local anesthesia (tumescent anesthesia) is administered. While this is taking effect, you can rest until the actual liposuction begins and breast augmentation is subsequently carried out. Most patients compare liposuction with a tingling feeling like that felt during a vigorous massage. So that your silhouette can be formed in the best possible way, liposuction is carried out when you are standing and lying down. When stem cell breast augmentation is performed, stem cells are obtained from a part of the liposucted autologous fat. During standard autologous fat transfer, the extracted autologous fat is injected into the breast without being treated. After liposuction, absorbent towels will be wrapped around your middle and thigh areas, as the fluid used for local anesthesia will seep out of your body. These towels are fixed with a bandage. To give extra support to your breasts during the healing process, you should put on a loose-fitting sports bra immediately after surgery. On the day after surgery, please remove the bandage and use the compression garments. If liposuction was carried out with microcannulas, you should wear the compression garments for around 1 week; if regular cannulas were used, they should usually be worn for around 4 to 6 weeks. The sports bra should be worn for approx. 4 weeks. Check-ups will be scheduled on an individual basis. You can contact us around the clock so that we can provide you with the best possible post-surgery care!